A short article in the Sunday Times Travel section informed “With an estimated 24,000 happy A-level students planning a year out, the travel trade associations ABTA says Thailand has topped the list of Britons’ gap-year destination”. The people: Thai people are really friendly and will go out of their way to help you and ensure you are getting the most out of your trip. Their English is also very good which is a relief as even though I tried my best to pick up on some Thai words/phrases I would not have got by. 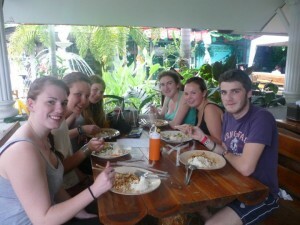 But it is not just Thai people that make it a fantastic place to go, but the fellow travelers you meet! I met people from all over the world that were really friendly and fun to be around. I am still in contact with people from the US and Canada thanks to Facebook, and we often reflect on how amazing Thailand was. The food: I was nervous about the food prior to my trip as although I would not call myself a ‘fussy’ eater I am not a fan of fish or spice. I was worried that this was going to be a daily battle, however, Thai food is incredible! I highly enjoyed every meal, and there was so much to choose from I never had to force myself to eat fish (and I actually really enjoyed the spicy dishes to my surprise)! My friends and I enjoyed the food so much that we even decided to do a Thai cookery course in Chaing Mai, which we loved doing and would highly recommend. 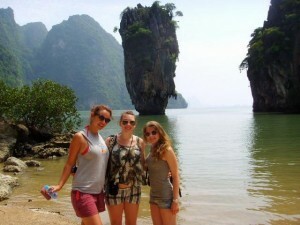 The sites: You will never be short of things to do in Thailand as in each destination there are plenty of temples to visit, boat trips, islands, beaches, treks and much more. My friends and I enjoyed every bit of ‘sightseeing’ as each temple or island has some thing different to offer and the scenery is truly breath taking. 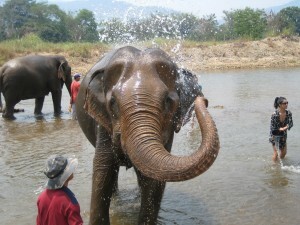 The wildlife: Thailand has some incredible wildlife to see including monkeys, tigers and of course elephants! There is plenty of volunteering options available, which are great to take part in to add to your travelling experience. Oyster offer some great volunteering opportunities in Thailand including: Marine conservation, Elephant park and Thailand wildlife sanctuary. Overall, I can understand why Thailand is a top gap year travel destination as it is exciting, vibrant, beautiful and friendly. I loved travelling Thailand and would go back in a heartbeat. A new attraction which could be worth visiting is a tubing place called Chiang Mai Tubing and Beach Club. It also has a slackline, beach volleyball and giant djenga.